Electricity is in the air over the announcement of her Presidential campaign. Although not the first female to run for the office of President of the United States, it feels like she’ll be the first woman elected to the most powerful position in the world. The 2008 Presidential Primary season is in full swing. Busy going back and forth from President Barack Obama to Madame Secretary Hillary Clinton’s camp, throw in Senator John Edwards with his commitment to his hair (yes it’s true) and you’ll get the feeling of the election season. At the time all were Senators, however, with quite different levels of popularity. Madame Secretary Hillary Clinton came to the production company on 20th Street in DC to sit in the makeup chair. Downstairs in the office building there’s a small makeup room with a tall director’s chair which sits before makeup lights around a mirror. Several containers of product on the shelf are left behind from other makeup artists who use the space on a regular basis. On location like this, I miss my Suze Makeup Studio space with minimal disturbance and maximum privacy where clients relax before a full length Pied a Terre mirror and are bathed in a soft natural light coming in from the windows looking onto Main Street and on the far side by a photographer’s light filtered by a white umbrella. Here the stark reality of the day is in your face. As I proceed to line her eyes, she asks politely about my work as a makeup artist. Her kindness, wit and intelligence drown out my nervousness of being responsible for the image of the first female President of the United States. Like a good doctor, she takes the time to listen to my responses and interacts with me before moving on. Granted she’s in the market for votes, however, our banter feels sincere. After finishing her makeup, which is more like a touch up since she’s already made up by other artists from earlier shows that morning, I observe HRC through the glass window of the video production room fielding questions which air on her Presidential Campaign website. Listening to her responses, I feel like I already know her on a more personal level from working with her in the makeup chair. As an artist, you’ve got to get real personal real fast. Right away, I’m in their face and have to get both of us comfortable with getting the makeup done. Working with powerful people in such a close setting,even from just a half hour or so of meeting with them, gets you close to their true being. Clinton’s brain power is evident. Her questions help me know she cares about my feelings. In Washington there are plenty of people, who are smart and strive to work together to achieve what’s best for our country. Yet, change occurs through a push and pull and a give and take. Politicians work outside a vacuum where they’re able to influence other politicians and voters. As much as politics requires these people skills, there are some politicians who seem interested in their own agenda. A particular politician from a few years ago comes to mind. Just like the slight Lloyd Bentsen gave Dan Quayle in the 1976 Vice President’s debate, the second time doing makeup for this politician my inner dialogue became something like the following. I know Hillary Clinton, and lady you’re no Hillary Clinton! 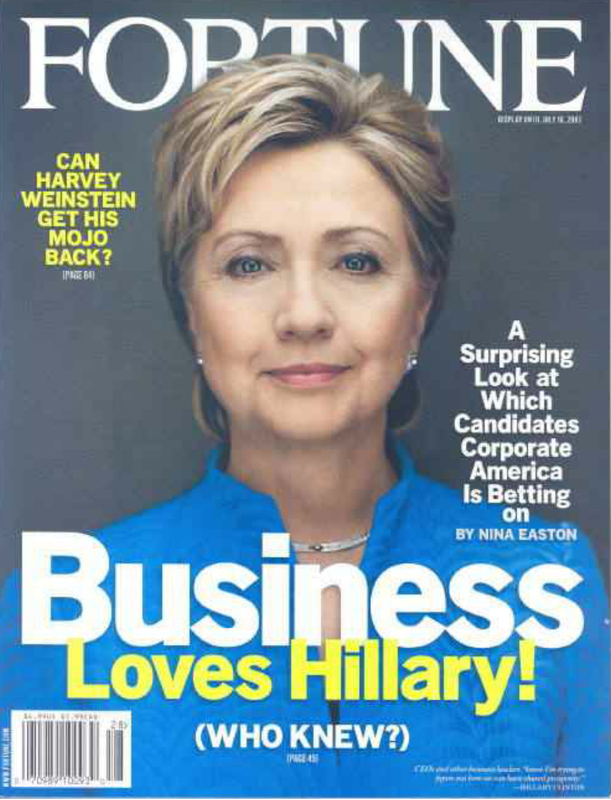 Fast forward a month or so later, I meet HRC again to do makeup for the cover of a magazine, which turns out to be a gorgeous portrait of her taken by California surfer dude Robert Maxwell. He baths her in banks of lighting that looks like you’re walking into a standing room of a tanning booth. Shadow less, she probably gets a tan from that shoot. Sunscreen SPF 50 stat! After joking around with the photographer that they both sport the same trendy white Chanel watch, HRC graciously offers to take a photo with our whole crew on set in the law office near Capitol Hill. With a casual air of confidence, she kids about how “stupid I sounded at that speech this morning” to which I respond that on the contrary, she is one of the smartest women ever. Later, someone asks what role President Bill Clinton will play if she’s elected President “I’ll make him ambassador to the world” she says. She went on to talk about the President’s incredible and serious attention to detail, while still keeping things light enough to have fun. She says that he can remember “every shot, at every hole, on every course” where he’s ever played golf. Her openness and friendliness with her remarks is the opposite of every preconceived idea I have about her. Granted she’s running for office and needs every vote, on the other hand, her warmth is tangible. With her consistent leadership qualities she displays on these two separate occasions, respect for her as a mother, wife and politician are planted. The recent news that she uses a personal email in addition to her official one is yet to be a factor. She’s so happy with my work that day; she asks if I’ll take up her on the offer to “do her makeup from scratch” at home. Of course, I say it’s an honor. Well, we’ll see if she calls again for her second Presidential Campaign. So far, with the her focus on the democratic voter rather than herself no request has come in. Here’s the link to her soft and low profile roll out from YouTube in The Washington Post article from 4/12/15 announcing her second run for President.